The fusion between graph theory and combinatorial optimization has led to theoretically profound and practically useful algorithms, yet there is no book that currently covers both areas together. 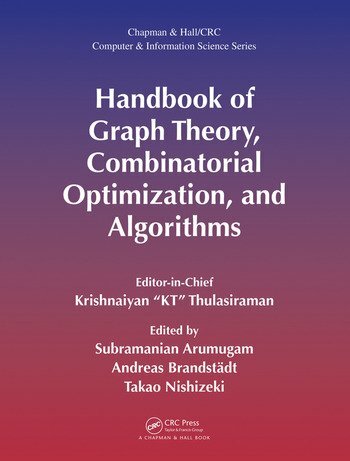 Handbook of Graph Theory, Combinatorial Optimization, and Algorithms is the first to present a unified, comprehensive treatment of both graph theory and combinatorial optimization. With contributions from more than 40 worldwide experts, this handbook equips readers with the necessary techniques and tools to solve problems in a variety of applications. Readers gain exposure to the theoretical and algorithmic foundations of a wide range of topics in graph theory and combinatorial optimization, enabling them to identify (and hence solve) problems encountered in diverse disciplines, such as electrical, communication, computer, social, transportation, biological, and other networks. Krishnaiyan "KT" Thulasiraman is a professor and Hitachi Chair in Computer Science at the University of Oklahoma and a professor emeritus in electrical and computer engineering at Concordia University in Montreal. He is a fellow of the IEEE, AAAS, and the European Academy of Sciences. Dr. Thulasiraman has received several honors, including the Distinguished Alumnus Award of the Indian Institute of Technology Madras, IEEE Circuits and Systems Society Charles Desoer Technical Achievement Award, and IEEE Circuits and Systems Society Golden Jubilee Medal. He is the coauthor of two graduate-level textbooks on graphs, electrical networks, and algorithms. His research interests include graph theory, combinatorial optimization, and related algorithmic issues with a specific focus on applications in electrical and computer engineering and network science. Subramanian Arumugam is a senior professor and director of the National Centre for Advanced Research in Discrete Mathematics at Kalasalingam University. He is also a visiting professor at Liverpool Hope University and an adjunct professor at Ball State University. Dr. Arumugam is the founding editor-in-chief of AKCE International Journal of Graphs and Combinatorics and author of 32 books and 195 journal papers. His current research interests include graph theory and its applications. Andreas Brandstädt retired as a professor in computer science from the University of Rostock after 20 years. Dr. Brandstädt has published extensively in various international journals and conference proceedings. He is also the author of a textbook and coauthor of a widely cited monograph. His research interests include stochastics, complexity theory, formal languages, graph algorithms, graph theory, combinatorial optimization, and related algorithmic issues with a specific focus on efficient algorithms based on graph structure and graph classes with tree structure. Takao Nishizeki is a professor emeritus at Tohoku University. He is a fellow of the ACM, IEEE, IEICE of Japan, Information Processing Society of Japan, and Bangladesh Academy of Sciences. Dr. Nishizeki has received several honors, including the Science and Technology Prize of the Japanese Ministry of Education, IEICE Achievement Award, ICF Best Research Award, Funai Information Science Promotion Award, TELECOM Technology Award, and many awards for best paper. His research interests include algorithms for planar graphs, edge coloring, network flows, VLSI routing, graph drawing, and cryptology.